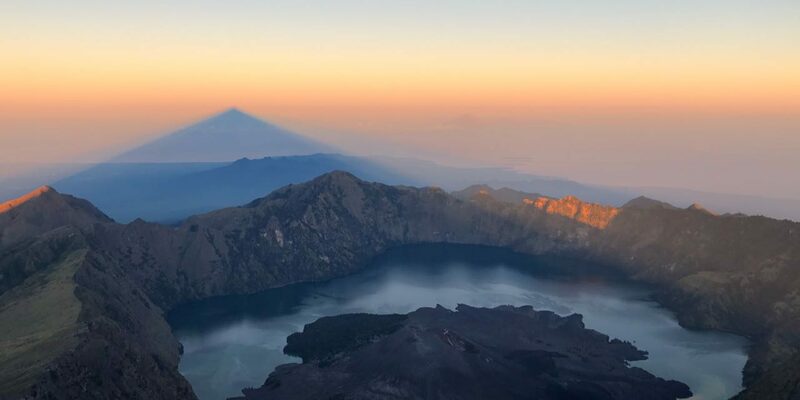 Mount Rinjani Trekking Summit and Segara Anak lake 4 days 3 nights start via Sembalun village to crater rim Sembalun, summit Mt Rinjani 3.726m, lake, swim in hot spring water, camping at crater rim Senaru and descent down the trek to Senaru village. Day 2: We wake at 3am for a light breakfast before commencing the challenging three hour trek to the summit (3,726 m). We arrive in time for sunrise, the best time to enjoy the spectacular views. Returning to our campsite on the crater rim we pause for a hot breakfast and a rest before continuing our descent into the crater. We stop for lunch on the shore of Lake Segara Anak (2,000 m) and set up camp. The afternoon can be spent swimming in the hot springs, fishing, exploring the lakeshore or simply relaxing. Day 3: After breakfast we continue our trek around the shore of Lake Segara Anak before commencing our climb out of the crater. The trail is steep and rocky and passes through dense forest. At the Senaru Crater Rim (2,641 m) we pause for lunch and a rest. The crater rim offers views across the lake back toward the summit and a good vantage point of Gunung Baru, the small volcanic cone within the crater of Mount Rinjani. Mount Agung in Bali and the Gili Islands can also be seen from here. We can camp here for the night, or if the wind is cold and we still feel energetic we can continue down the mountain and spend the night at a more sheltered campsite in the forest. Day 4: After breakfast we continue our descent of the mountain, utilising the rest spots of Pos 3, Pos 2 and Pos 1 and stopping for a longer break for lunch along the way. As we descend the mountain the forest becomes thicker and increasingly lush. We arrive in Senaru (601 m) at approximately 1 pm, from where you will be transported to your next destination.